Nothing beats a truly memorable present that's made just for the person receiving it. And at Personalised Fizz we do just that. Just call us to order! 3. We'll do the rest! Just choose your bottle - red, white, fizz or Champagne - and we'll decorate it with a personalised message. Just call us on 01793 642569 to order. 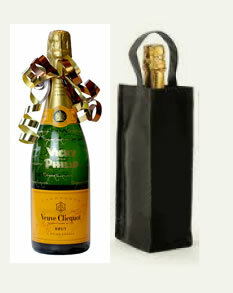 Why not have your personalised gift bottle delivered in a presentation bag! "Our son really enjoyed his gift, which arrived on time and was great value for money"